Dual Spine Weight Forward® – Patented fusion of two different carbon materials that create 2 spines in 1 arrow to manage energy better and make arrows recover faster, spin 20% sooner, retain more speed and deliver unparalleled accuracy. BuffTuff® Plus – Back shaft section made with patented BuffTuff® Plus carbon weave construction, which provides consistent spine consistency, strength and durability. 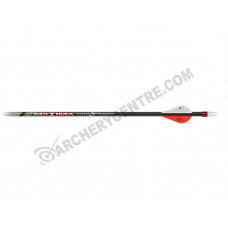 BuffTuff® – Front shaft section made with patented BuffTuff® the world’s toughest and quietest carbon arrow finish. Featuring Mossy Oak® Treestand® pattern. Matched Set – all Maxima Hunter® 6- and 12-pack sets are sorted and matched by weight and spine for best-in-class consistency. Spine selection sorting tolerance is +/- 0.0025". Weight sorting tolerance is +/- 1.0 grains. Real Straightness – Every Maxima Hunter® arrow is laser checked for straightness to a remarkable 1/10,000 of an inch. Maxima Hunter® straightness of +/- 0.0025" is a maximum measurement, not an average. LAUNCHPAD™ Precision Nock – LAUNCHPAD™ Precision Nocks come standard on all Maxima Hunter® arrows and shafts to deliver a controlled arrow release, better shaft alignment and more consistent accuracy shot after shot. Performance Vanes – Maxima Hunter® arrows come fletched with either Blazer® or Fusion® performance vanes. Nock Collar – Carbon Express ® proprietary BullDog™ Nock Collar comes standard on all Maxima Hunter® arrows and shafts to protect the shaft against nock-end impacts. 50675 250 12 pack 8.0 0.417" 0.295"
50676 350 12 pack 8.9 0.337" 0.297"
50677 450 12 pack 9.7 0.298" 0.303"
50690 250 6 pack 8.0 0.417" 0.295"
50691 350 6 pack 8.9 0.337" 0.297"
50692 450 6 pack 9.7 0.298" 0.303"
50685 250 12 pack 8.0 0.417" 0.295"
50686 350 12 pack 8.9 0.337" 0.297"
50693 250 36 bulk 8.0 0.417" 0.295"
50694 350 36 bulk 8.9 0.337" 0.297"
50680 250 6 pack 8.0 0.417" 0.295"
50681 350 6 pack 8.9 0.337" 0.297"